Be kind, this is my very first attempt at painting with acrylics, ever. I’ve painted with water colors before but never with actual “paint”. I bought a bunch of art supplies (acrylics, canvas, graphite and tools) over a year ago but when the Gang Stalkers attacked, I haven’t been able to use them. I may not even have them anymore since my room was burglarized by the maintenance man and my landlord at the All Star Hotel (Tenderloin Housing Clinic manager Aubrey & maintenance man “Victor”). Anyway, I was helping my mom shop for silverware trays at Marshall’s when I spotted this Easel and Painting Set made by Winsor & Newton for twenty dollars. Since I already had a set of their calligraphy inks and liked them, I figured I could finally get to test out some acrylic painting. Practice for when I was finally able to use the other supplies I bought. 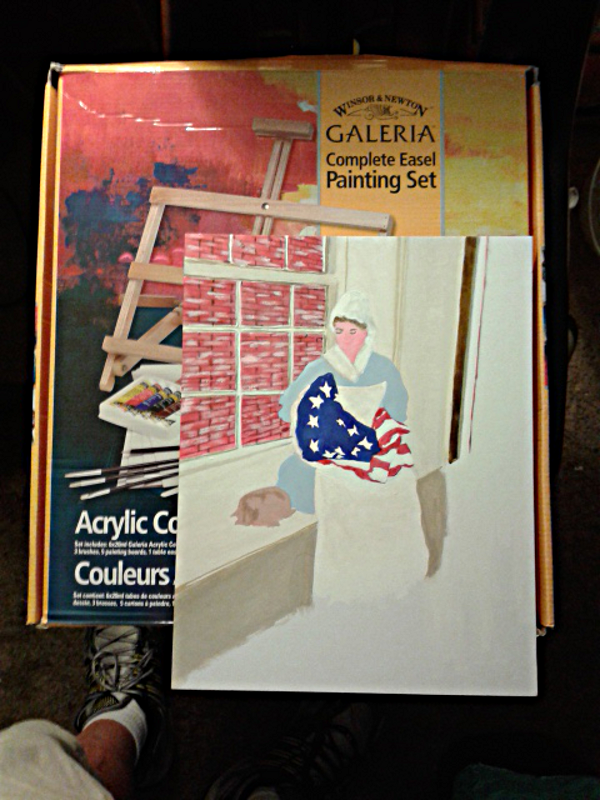 The set came with a table top easel, six tubes of Acrylic paints, two spatulas, six pre-shrunk canvas boards, a graphite pencil, and instruction booklet, a mixing palette and two synthetic round brushes plus a flat. The only thing missing was black, impossible to change the tint without. When I originally bought the other supplies I had a long talk with the salesperson. He told me acrylics were best because they could be worked either like oils or watercolors. The only caveat he gave was that you layered them. I didn’t understand what that meant. The experience was something quite different from the talk. I found that you must mix your pallet before painting, they don’t seem to blend at all on the canvas. You have to work fast as well, undiluted they dry fast and will gum up the brush. That was something of an advantage as well because you could cover different areas without fear of smudging. The colors change a little when dry, so you have to get used to that. You should also do a complete drawing before starting (I was so excited I did not) as correcting uses more paint. Surprising how fast the tube goes flat. You can make the drawing as dark as you like if using the paint undiluted, it is very opaque and covers well. The set did not come with an eraser for this reason, the paint will just cover. As to subject matter, I wanted my first to be something special. 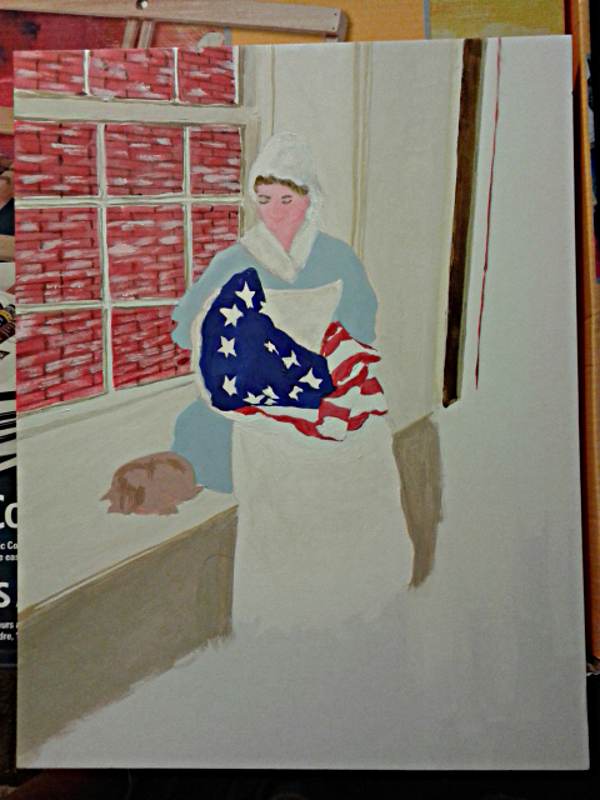 I chose Betsy Ross making the first flag for the Thirteen States. I’m having trouble with her but will take photos as I finish, the photo below is four hours worth of “work”. This is my very first time painting so please don’t be too critical, I promise that I’ll stay with her until she is presentable. Oh, thats another nice thing about acrylics, THEY’RE TOUGH. You can just throw it to the side without worrying about it getting damaged until you are ready to paint again.